Seafood you can count on for exceptional quality. Our True Tides brand represents the best we have to offer. Premium, wholesome seafood, from all-natural fillets to restaurant-style calamari, that will delight your customers every time. Whether caught in local waters off the coast of New England or from far-away fisheries around the world, the True Tides name is our commitment that this seafood has been carefully handled to maintain its fresh flavor that will lead to an exceptional dining experience. True Tides Calamari is wild caught in North and Mid- Atlantic ocean waters. 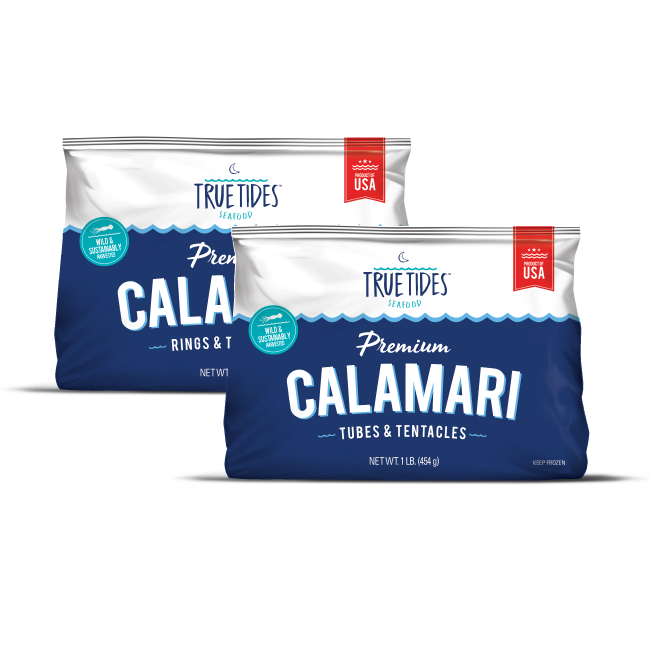 A sustainably harvested product of the USA, True Tides Calamari is offered fresh and frozen in an assortment of product varieties. Fresh: 5 lb. or 10 lb. packs – Tubes & Tentacles, Rings & Tentacles, Rings Only and Tubes Only. Frozen: 2.5 lb. Tray – Tubes & Tentacles, Rings Only, and Tubes Only. 1 lb. Tray – Rings & Tentacles, Tubes & Tentacles. 2 lb. Bag – IQF Rings.. Attractive packaging will help to establish brand awareness and build a loyal following for this premium calamari offering. From the back of the house at well-known restaurants to the fresh case at leading supermarkets, True Tides products are winning customers wherever great seafood is the standard. Let’s discuss a program for your business! A note to our customers and prospective customers: our True Tides line is always expanding. Check with us often about new products, or to ask if we can pack a new item to meet your needs.